And now to our Perfect Picture Book Friday selection! It is not easy to deal with death and loss. Often, the first death a child experiences is the loss of a beloved pet. Parents may be are unsure how to handle this type of situation and feel uncomfortable even talking about the subject. Here is a book that might help. Mousie is the little boy’s beloved pet. When Mousie gets sick and dies, the little boy goes through the various stages of grief. First he denies it…”Mousie is NOT dead! He’s just very, very sleepy this morning.” Eventually, with the help of his parents, the little boy accepts the death of his pet and comes to understand that it is ok to feel angry and sad. I love this book because it takes a difficult subject and deals with it in a sensitive loving manner. Young children need to understand that death is a normal part of life. They also need to be allowed to grieve and be angry or sad when someone they love dies. Often, parents try to shield children from the truth about such matters…or, when a pet dies, they brush it off as if it was unimportant…but this book gives parents a gentle and loving example of how it can be done with respect and sensitivity. In the story, the little boy paints a shoebox that he will use to bury his beloved pet. Children do love to paint…and fingerpainting so much fun. The sensation of the cool thick paint sliding under their fingers can be very calming for many children. And painting is a wonderful vehicle for expressing emotions. You will need: Fingerpaint (can be bought at hobby shops and toy and department stores OR you can make an EDIBLE fingerpaint by stirring up some vanilla pudding – white/yellow – chocolate pudding – brown – strawberry pudding – pink. 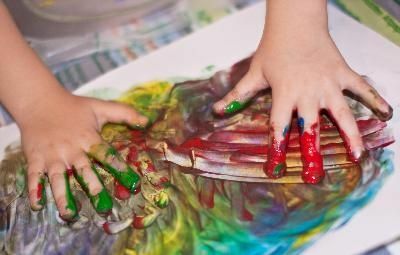 The edible fingerpaint is fun for kids of all ages), fingerpaint paper (you can use a roll of inexpensive shelf paper instead), COVERUPS for children and work surfaces. This entry was posted in children's picture books, Crafting with Children, grief and loss, Perfect Picture Book Friday and tagged Children's literature, Perfect Picture Book Friday, Robie Harris, Susannah Leonard Hill by viviankirkfield. Bookmark the permalink. Loss is so difficult for all of us – there can never be too many great picture books to help kids deal with it. It’s so weird how each week similar topics show up on the list. You have this book about pet loss, and Kimberley posted The Scar which is about a boy losing his mom. It would be nice if kids never had to deal with such things, but since they do, it’s wonderful to have books like these to help them. I will be getting over to read the other picture book reveiws later tonight…just got back from the staff training program…lots of fun! One of the young male teachers shared that he had dropped away from reading at about age 8…and returned to it many years later…he regretted losing all of that time being separated from books and wondered what tips I might share to help teachers and parents who face similar problems with their kids. I suggested that the adults should be seen reading, that books be found that relate to the particular child’s passions and interests, and that they make passports and have each page stamped (like a visa stamp when you enter another country) for every book read…when the passport is filled, they could go on a field trip to a place that is related to the child’s interests. What do you think? sounds like a lovely book on a difficult subject. thanks for reviewing it. Thanks for sharing this book and all of your resources. My kids had a hard time losing their cat and I think this book sounds like it would have been wonderful to share with them. I like the finger painting idea a lot! Vivian, the “Mom and Dad Debate” article about too much TV, etc. was an excellent summary of your suggestions, especially the part about parents being the living, real examples for the children. Good job! I could have used this books last year when our dog died, Vivian. We floundered through it, but it’s nice to know about resources that are available. I enjoyed your TV article too. I followed the link about TV. We watch some PBS shows, but not a lot. I’m interested to see how the iPad/Kindle time gets factored into future studies. My son enjoys playing with interactive books, etc. Of course, he enjoys running, running and running some more and playing too. I’m glad you highlighted this book. It’s so important for this topic to be available for children. Thanks, Stacy…glad you checked out the article on TV watching. 🙂 I think it’s important to have a balance in all that we do…TV (or computer) can be part of a child’s day…but, as you say, they also need running and playing as well. Yes, the book is lovely and does a wonderful job with a sensitive subject. I commented on our TV experience on your other post so I won’t repeat myself here. Books can be so useful in making kids understand what’s going on around them they have no control over. We’re big fans of Charlie & Lola, both the books and TV series. In one of the episodes, their mouse Sizzles dies during the night, and it shows the kids go through the whole grieving process. My kids really felt for Charlie & Lola, and why they were sad. A lot better than I would have explained it to them. We lost our old cat a couple of years ago but I think they were too young to get it, although they do talk about him being gone sometimes, so things do sink in. Thank you so much for sharing, Milka. I totally agree that there are some TV shows that can be great for kids…especially if a parent sits and participates with the children, as you do. 🙂 It’s just that TV can become the babysitter/role model/main influencer for some kids…and that’s not good. Loss of a pet is often the first experience young children have with the grief process…so books or shows that address that issue sensitively are valuable! This sounds a great way to help kids deal with death. I ought to read this, since one of my 12 x 12 covers dealing with the death of a friend’s mom. Thanks Vivian and yes my youngest watches too much tv. I really have to take her to play group and the park to get her away. And she’s so creative away from it it’s a shame. I’m working on it! I know, Catherine…it’s hard to balance home, family, work, time for oneself. 🙂 We can only do our best…my kids watched TV also…and I enjoy zoning out for an hour or two in the evening with a big bowl of popcorn and something light on the TV. 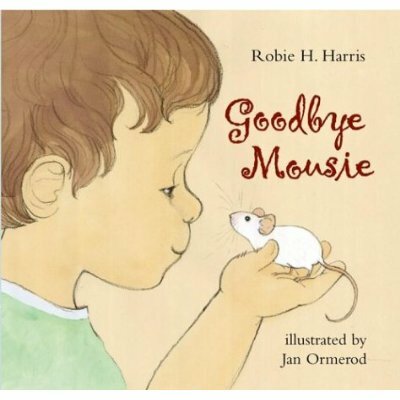 😉 I think Goodbye Mousie is one of the sweetest books on this sensitive topic because it gives us the child’s perspective and shows how supportive the family can be. I am always looking for pet loss books and have reviewed a number of them. But, I really like this one because it goes through the stages of grief with a child. Thanks for sharing this book. Pat, one of the most amazing things about Susanna’s Perfect Picture Book Friday is that no matter how many picture books we have read, there are always other great ones out there that we haven’t…and this Friday book review posting affords us the opportunity to discover those. 🙂 Glad the book will be helpful to you! This sounds like such a special book. I can’t wait to find a copy. A great review! Thanks for adding it to the list Vivian! “Young children need to understand that death is a normal part of life. They also need to be allowed to grieve and be angry or sad when someone they love dies.” Yes, yes, yes to this. Our society treats grief as if it were a 24 hour stomach virus instead of the ongoing process it truly is. Thank you for sharing this book, Vivian! You are so welcome, Heather….thank you so much for your enthusiam over this book. 🙂 Treating death like a 24-hour virus…I love that…so true. Worse yet is when death is shoved under the rug and not acknowledged at all…when a child loses a parent and the other parent closes up about it and won’t let the child remember or grieve the loss…check out “When Charlotte’s Mom Died”…awesome book that addresses that issue. It sounds like a lovely book. I would definitely read it to a grandchild or little friend, but I know I would cry if I read it to my class. But it’s very good to know about books like this. Thank you. This sounds wonderful for such a difficult subject. I will definitely be reading this one. Thanks for adding it to the PPBF list. Glad you liked it, Penny. 🙂 Death is one of the most difficult topics to discuss with young kids…it’s great when we can find good tools to help us!